Now you can purchase the very same temporary tattoo formula and supplies used by Hollywood make-up artists to do tattoos for movies. You can see examples of these Henna tattoos on Sean Penn in "Dead Man Walking" and George Clooney in "Dusk 'til Dawn". Why use our Henna Kit ? 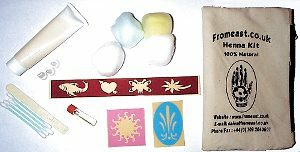 Henna kits allow you the chance to create fun tattoos and detailed artwork without it being a huge expense. You can do it on your own time too instead of needing to get an appointment locally. With the great stencils you will be able to create a look that is fun, detailed, and appears professional. Not all henna kits have the same items or the same quality though. In order for your artwork to turn out well and to last for a week or so, you need to make sure you buy a quality kit. Anyone could do it! Pre-measured for perfect consistency every time. Our paste lasts 12 months (versus 6 months with other kits on the market). What do I get in the Kit ?